I have visited the Sumaco National Park areas in the past but recently I discovered that the local community of Pacto Sumaco has a cabaña to provide rustic lodging for birders. I decided to help them get started and organized a bird watching tour that would include a night stay at their cabaña. At first I was a bit nervous about lodging in a remote and rustic setting, but after visiting the place I decided that the risk would be compensated with a beautiful scenery that the place offered. The day finally arrived and we were greeted by the two locals who helped us carry our gear to the cabaña that is located at 15 minutes walk from their community. We left our car and walked on a log trail that took us through deforested land that had a few trees left which provided some shelter for the local birds. 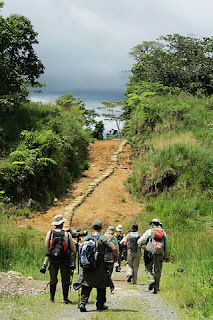 The trail was a bit difficult from the unevenness of the tree steps that kept us above the surrounding mud. When we arrived to the cabaña we were greeted by three friendly women who would take care of feeding us for the next 24 hours. Since the cabaña has two large rooms we split the group into male and female dorms. This was totally different than our previous arrangements of privacy but it seemed as a small sacrifice to get into this area. The cabaña has a second floor which serves as a viewing platform to the Sumaco Mountain and the surrounding protected forest. There are also some hammocks that allow you to appreciate all of this from a different perspective. An afternoon walk on the trail which continued away from the community produced a few new birds for the trip list including: Cerulean Warbler, White-bellied Woodstar, a mating pair of maroon-tailed Parakeets, Black-crowned Tityra, Buff-throated Tody-Tyrant, Crested Oropendola, Lafresnayes Piculet, and a pair of Collared Trogons. 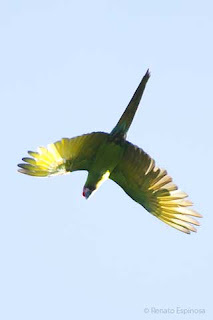 The most interesting show started upon our return to the cabaña when we witness the return of many Macaws and parrots to roosting trees near the cabaña. The evening came and dinner was served with candle lights and the local night frog orchestra. After working on our bird list for the day we retired early in preparation for an early start. The beds where comfortable and properly setup with mosquito nets to prevent the annoying buzzing disturbance for a restful night. 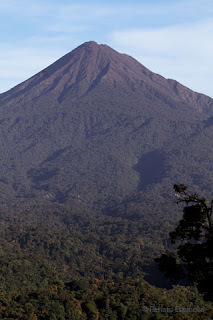 Before daybreak I could hear the wakeup calls of the Pauraque, the Wattled Guan, and a Ferruginous Pygmy Owl. I could not rest more so got up before daybreak to identify more clearly another owl which turn out to be one of our own trying to call a Tropical Screech Owl. Soon enough many other birds joined the waking day: amongst them numerous parakeets, parrots, and Macaws. 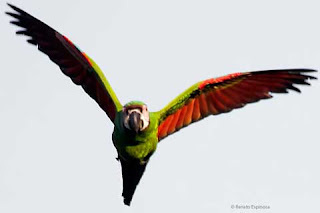 The fly-bys started and soon all the members were up and enjoying a morning spectacled of Mealy Amazon, Red-billed Parrots, Maroon-tailed Parakeets, White-eyed Parakeet, Military Macaws and finally an incredible close fly-by of the Military Macaws. If you want to experience these wonderful birds and sights then contact the Pacto Sumaco community (www.sumacobirdwatching.com) or take one of our spectacular tours that visit the East and West slopes of Ecuador.